When I'm out of ideas for dinner Jen usually comes through with some recipe she found on a blog that features better food, actual recipes, and far superior photography from this one. Normally I don't execute these recipes by the letter but rather wing it and add my own touch. Last night I got home around 8:00 PM and had roughly 45 minutes before I had to pick Jen up from the train. Jen had shared this macaroni and cheese recipe with me earlier in the day and since we had most of the ingredients already I figured I'd give it a shot. I started off by slicing out the stems form some rainbow chard, chopping them up, and cooking them in a pan with some onion, olive oil, and butter. When they were tender I added the chopped chard greens and cooked them down with a sprinkling of salt and pepper. I then sprinkled the cooked vegetables with flour, mustard powder, and drizzled a little Worchestershire sauce on top. In a separate pot I boiled some fusilli and cauliflower together in salted water for about seven or eight minutes until the cauliflower had softened slightly. After that I drained them both, returned them to the pot, added a little milk and half and half, brought it back to a boil and added it to the floured rainbow chard mixture to thicken. 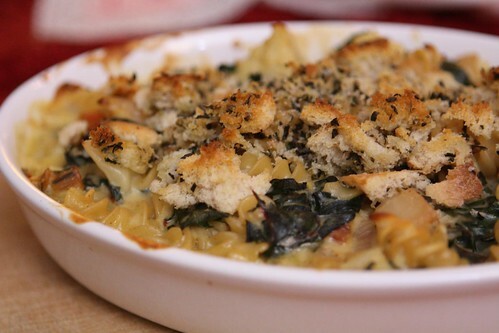 I grated a little nutmeg into the mixture, put it into a casserole dish, and topped it with crumbled bread crumbs from an old loaf of bread which I'd tossed with olive oil, oregano, and basil. Initially I wanted to add some rendered bacon and shrimp to the dish but as I was pressed for time it was just about everything I could do to be able to get this in the oven before I left for the train. 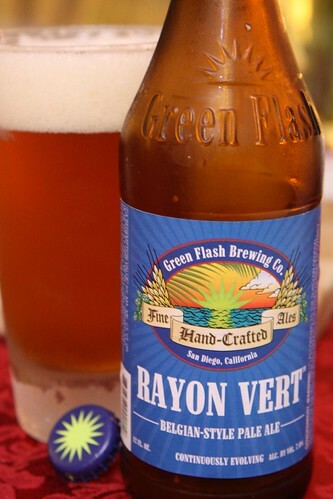 To accompany this dinner I had one of the beers Jen got me for Valentine's Day, this Rayon Vert Green Flash Brewing Co. This is a beer I passed up on numerous occasions because I didn't really know much about it. Then I stopped seeing it around and then I started hearing about how amazing it was and how scarce the supply was. Jen picked it up not knowing any of this so I was very grateful. I made this the first of my Valentine's beers to have since it should be consumed fresh. It was every bit as good as I've been hearing. It was a cut above your normal nice west coast IPA with similar characteristics like a nice fresh grapefruit juice finish. It calls itself a Belgian Pale Ale but I didn't really pick up much Belgianness from it. Perhaps this is because my palate is not as refined as a beer expert's. I only have three tasting notes: good, bad, and hoppy. And I don't really know what hoppy means.